8.95 | New England style full of clams, potatoes, & onions. 5.95 | Specialty soups include either conch chowder, lobster bisque, or Chef’s creation. 8.95 | Baked French bread topped with cheddar, Monterey jack, blue cheese crumbles and diced tomatoes. Add bacon or jalapeños for $1.00. 8.95 | Cuban black beans blended with fresh seasonings, jalapenos, tomatoes, melted jack and cheddar cheese, served with tortilla chips. 6.95 | GF | Crisp greens with fresh tomatoes, cucumbers, carrots, red onion with your choice of dressing. 7.95 | Fresh Romaine hearts chopped and tossed with our caesar dressing topped with parmesan cheese and fresh made croutons. 8.95 | Our huge chunk of locally farmed lettuce with red onions, carrot threads, chopped smoked bacon, diced tomatoes, homemade croutons and our buttermilk blue cheese dressing. 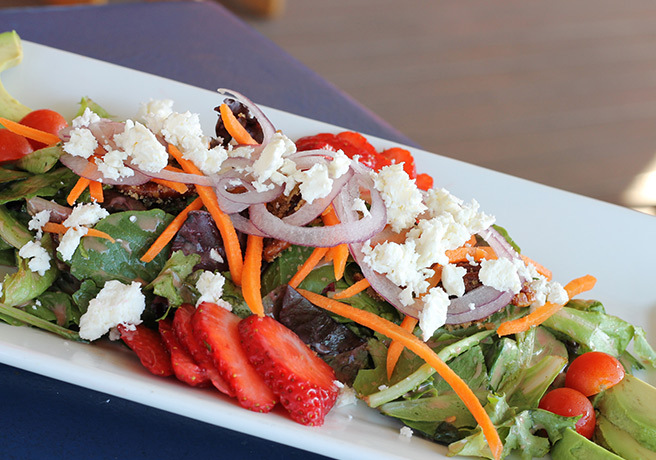 9.95 | Fresh baby greens tossed in a strawberry & raspberry dressing with tomatoes, avocado, candied pecans, seasonal berries, carrots and crumbled feta. 1/2 Dozen 10.95 | Full Dozen 19.95 | Freshly shucked Gulf Coast oysters served raw on the half shell or steamed in a white wine, garlic butter sauce. Served with crackers, cocktail sauce and lemon. 12.95 | Five shucked oysters crowned with a tabasco horseradish butter with a touch of bread crumbs and baked until golden brown. Served with fresh baked bread for dipping. A tongue twisting delight! 12.95 | GF | Half pound of steamed shrimp with split back for easy peeling. Prepared hot steamed or cold served with cocktail sauce and lemon. 10 Pcs 9.95 | 20 Pcs 18.95 | Whales don’t have wings, but we do! The best on the beach. Tossed with your choice of Hot, Medium, Mild, Teriyaki, Garlic, BBQ, or Jerk. 9.95 | Four proscuitto wrapped shrimp grilled and basted with our house made BBQ sauce. Served with a side of corn bread. 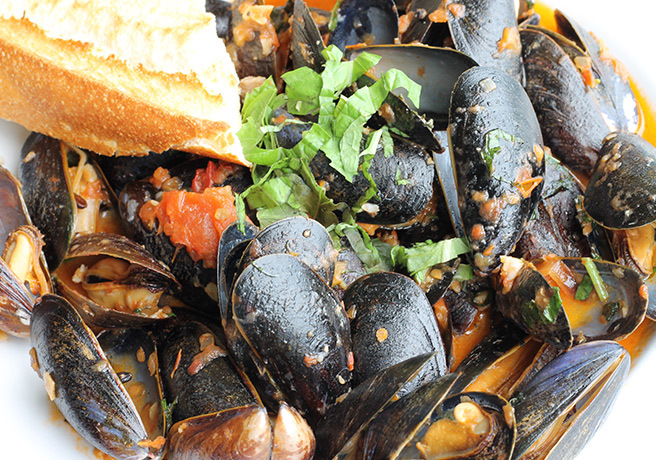 12.95 | Fresh PEI Mussels steamed in a broth with wine, butter, garlic, shallots, tomatoes, basil and a touch of cream. 9.95 | Calamari lightly breaded and fried then drizzled with a sweet thai chili sauce. Or, served original with cocktail sauce. Half lb 15.95 | Full lb 28.95 | You peel ’em steamed shrimp in a dressing of butter, garlic, mild Columbian chilies, fresh cilantro and fresh key lime juice. Served with fresh baked bread for dipping. No judgements for licking the bowl. Make any basket a meal! Basket 8.95 | with 2 sides 14.95 | Fresh Chicken tenders hand breaded and fried golden brown. Tossed with your choice of Hot, Medium, Mild, Teriyaki, Garlic, BBQ, or Jerk. Basket $9.95 | with 2 sides $15.95 | Hand peeled gulf shrimp served plain fried, coconut crusted, or buffalo style. Basket 9.95 | Lightly dusted with seasoned flour served with house made tartar sauce and lemon. Basket 8.95 | with 2 sides 14.95 | 4 large cuts of fish crispy fried served with house remoulade sauce and lemon. Basket 13.95 | with 2 sides 19.95 | Fresh 8oz Florida grouper cheeks lightly blackened or fried. Served with house tartar sauce and lemon. Basket 9.95 | with 2 sides 15.95 | New England jumbo strips lightly breaded. Served with house cocktail and lemon. Basket 9.95 | with 2 sides 15.95 | Half a rack of fall off the bone ribs basted with our one of a kind Texas BBQ sauce. Served with cornbread. 11.95 | Marinated chicken char grilled served on a toasted ciabatta bun spread with chipotle mayo and topped with lettuce, tomato, onion, crispy bacon and cheddar cheese. 10.95 | The only place to get a more traditional Cuban is Havana! Slow roasted pulled pork shoulder, smoked ham slices, sliced pickle & swiss cheese on Cuban bread spread with a spicy mustard. 18.95 | Fresh hand cut grouper served your way blackened, grilled, fried, or crunchy served on a toasted bun with lettuce, tomato, onion, and tartar sauce. 10.95 | Pan seared panko breaded fish filet served on a lightly toasted bun topped with coleslaw and spicy remoulade. 10.95 | Hand pressed and char grilled served on a toasted bun with lettuce, tomato, onion, & your choice of cheese. Add grilled onions, mushrooms or bacon for $1 each. 16.95 | Mexican influenced spiced Mahi grilled on a toasted bun with lettuce, tomato, & onion topped with mango avocado relish. 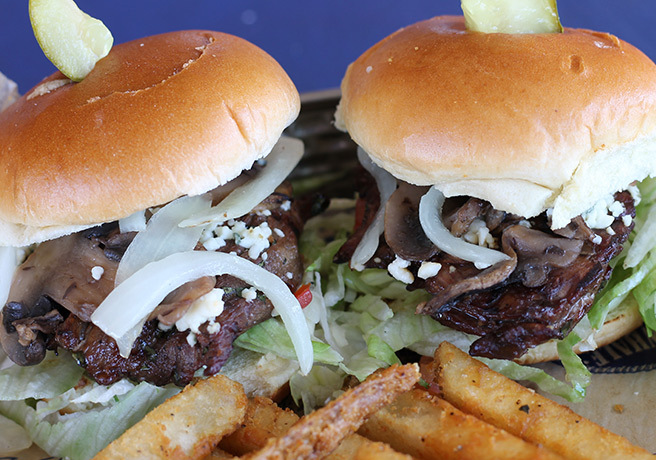 14.95 | Two marinated skirt steak sliders with caramelized onions, mushrooms & blue cheese served on brioche slider buns with our house made tangy spread. 13.95 | GF | Slow roasted pork shoulder with roasted tomato and onion salsa. Piled high in corn tortillas. 14.95 | Served with choice of fried boom boom or our signature Yucatan style. Piled high in flour tortillas. 13.95 | Pan seared fish sprinkled with whale dust and topped with with avocado mango salsa. Piled high in flour tortillas. 14.95 | Gulf grouper cheeks blackened or fried with guacamole and a side of tartar. Piled high in flour tortillas. Your choice of Side Salad or Caesar for an additional 3.95. 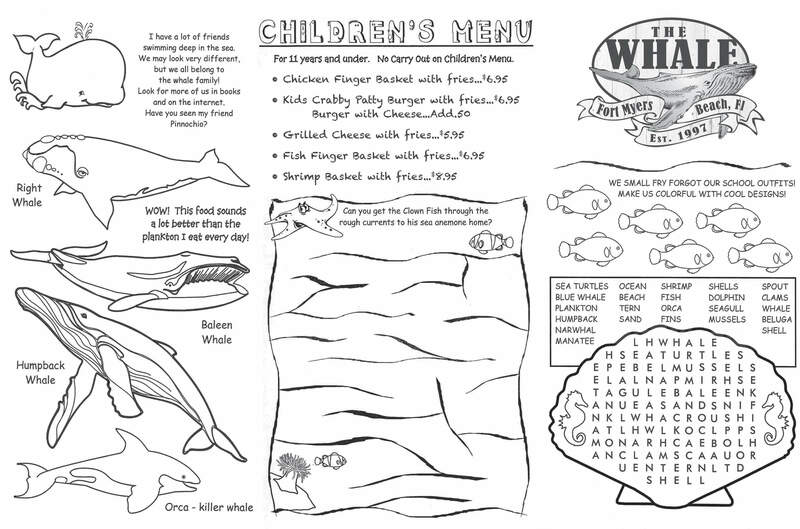 18.95 | The original Whale fish dinner you’ve enjoyed since 1997. Served fried or crunchy with a side of French Fries, Coleslaw, and house-made tartar sauce. 22.95 | Lightly coconut breaded snapper deep fried and served with sweet chili pineapple glaze, jasmine rice and house vegetables. 21.95 | Marinated Gulf shrimp sautéed with garlic, fresh ginger, cilantro, wine, butter and lime juice served with a rustic Monterey jack cheddar potato cake and fresh vegetables. 19.95 | Seared chicken breast cuts, Spanish chorizo, sautéed with garlic, artichokes, mushrooms, red peppers, and onions. Deglazed with Chablis wine and balsamic reduction, house vegetables, & a rustic potato cake. Chicken 16.95 | Steak or Chicken 17.95 | Served on a sizzling hot plate combined with sautéed onions, poblano and red peppers. Accompanied with flour tortillas, salsa, guacamole and sour cream. Add cheese for $1. 19.95 | GF | Grilled 8oz skirt steak marinated with cilantro, parsley and garlic covered with chimichurri sauce and garnished with lime infused white onions. Served with black beans and rice. 23.95 | GF | Freshly dusted with a house made Piri Piri spice blend then pan sautéed with a touch of wine and lime juice. Served with caramelized plantains, yellow rice and house vegetables. All kids meals are served on take-home frisbees perfect for the beach! We have some favorite items. Our signature whale icon signifies a Whale's favorite!